On December 3, 2013, a group of activists, including labor leader Eliseo Medina, ended a 22-day fast on the National Mall in Washington, D.C. The closing of this fast marked an official end to the legislative efforts of 2013 to pass an immigration reform bill. Despite powerful acts of protest and activism in support of policies that might improve the well-being of immigrant communities, the year resulted in many disappointments. Despite the historic passage in June of a comprehensive immigration reform bill in the Senate, which included provisions for a path to citizenship, it would have also ramped up enforcement and border militarization. In the second half of the year, the Republican leaders of the House continued to drag their feet, giving lip service to both their conservative base and the rising Latino and Asian electorate. Instead of taking up the Senate bill, the House leaders introduced (and, fortunately, failed to pass) many piecemeal bills, such as the KIDS Act, SAFE Act and Border Security Results Act, that came far short of achieving justice for undocumented immigrants. As in previous years, there were a very high number of deportations in 2013, reaching nearly 2 million since President Obama took office. A recent New York Times article helped bring attention to the many struggles that families continue to face as a result of the deportation of a family member. These deportations have become a the central and incredibly harmful component of our nation’s immigration policy. Yet, President Obama continues to claim that he lacks the power to halt deportations, despite the mounting demands that he exercise his executive power. On a more positive note, 2013 was the first full year of implementation of the Deferred Action for Childhood Arrivals (DACA) policy. Reports indicate that many eligible young people have yet to apply, indicating that outreach efforts and legal clinics in 2014 will be critical to ensure all who are eligible can apply. Data as of August 31, 2013 indicate that about 567,500 people, only about 52 percent of the eligible, had applied, with significant differences across different ethnic groups and immigrants in each state. As the fight for immigration reform continues, the implementation of the Affordable Care Act (ACA) tumbles along. The latest development for the ACA has been the online health care marketplace, healthcare.gov. Each new provision is a political battle, with talking heads making predictions of the impending success or doom of the ACA. While the ACA is touted as a policy that will bring health care access to millions of Americans, its exclusion of many immigrants will not only harm their health, but the well-being of the entire nation. Legal permanent residents are included in the new system of health insurance options, with burdensome barriers. Undocumented individuals and those who have received DACA, however, are not eligible. As a result, access to health care will continue to be a major problem for the health of immigrants. For example, Mexican immigrants have the highest rate of uninsurance at 13%. Now under the ACA, Latino’s are enrolling at lower rates than other racial groups. This may be due to reports of mixed-status families avoiding government programs for fear that they may be entangled with ICE. Although access to health care is lower for immigrants, there are counties in California where all people have the right to access health care. Progressive counties like San Francisco have a health care system that gives access to all, whereas other counties, such as Fresno, provide health care to a smaller proportion of their population. The evolving and varied landscape of health coverage can be demonstrated by the report from the Health Access Foundation ”California’s Uneven Safety Net: A Survey of County Health Care.” The report describes access to healthcare for undocumented immigrants in counties throughout California. In each county the complex systems of care are the result of political battles over inclusion of undocumented individuals in public programs. Political battles to include all immigrants, regardless of legal status, are critical to ensure that individuals benefit from public programs such as the ACA, and are included in all aspects of national life – from the workplace, to schools, to communities. Indeed, it was the many movements and protests of 2013 that give us hope for 2014. 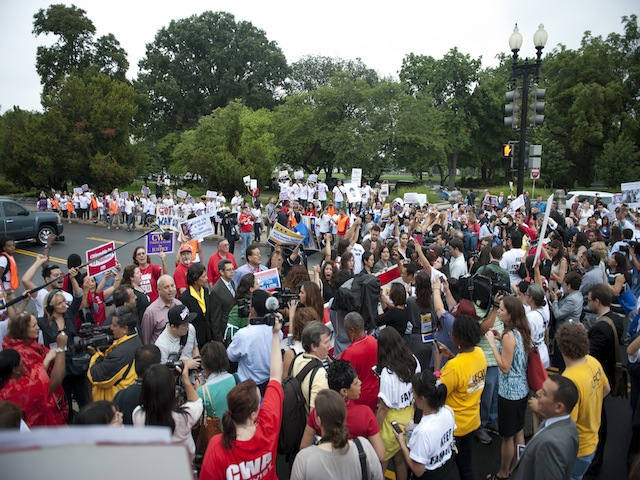 One journalist titled 2013 The Year of the Immigrant Rights Movement. The year’s bold activists, including the Washington Mall hunger strikers, did much of their work outside of the halls of Congress, taking their message directly to the source to critique the injustice of not creating a path to citizenship and the deportation industrial complex. In the California Central Valley, immigrants protested weekly outside of the home office of House Majority Whip Kevin McCarthy. One protest included a sit-in by women whose presence forced the Representative and his wife to eventually show face and meet with them. 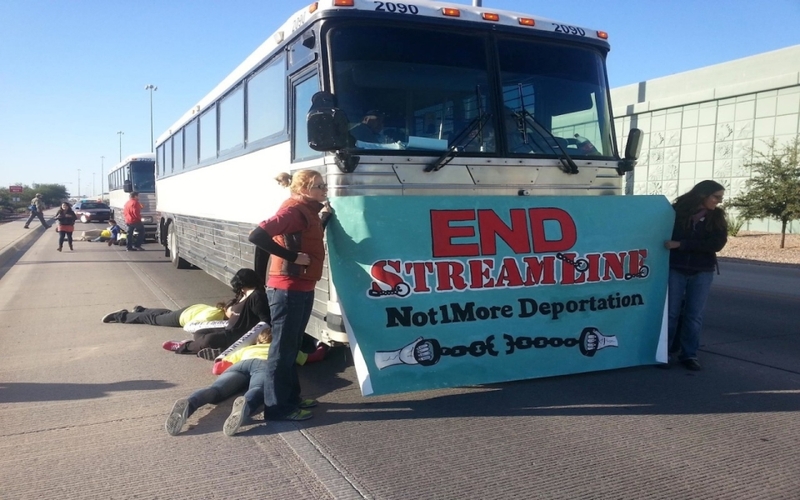 Protests sprung up around the nation after a group in Tucson used their bodies to stop a bus filled with individuals en route to deportation. Other protests sprung up in San Francisco, Philadelphia, and Los Angeles. Finally, a brave group of youth, the Dream 9, attempted to enter the country (after leaving or having been deported). This act of civil disobedience highlighted the injustice of deportation, the border, and the lack of citizenship. While these actions did not show immediate results at the national level, state legislation in California, for example, moved to ameliorate the challenges that immigrants face because of federal policies. In 2013, the scientific literature on immigration status as a social determinant of health saw tremendous growth. One big problem with the public health literature concerning immigrants, and specifically undocumented immigrants, is the focus on access to health care. Here we have selected a few examples of articles that examine the consequences of undocumentedness, and how it can impact health outcomes. The home is a place of safety and refuge. This article investigates the housing quality of undocumented Central Americans and finds few surprises. Poor housing quality indicators abound, such as crowding, poor structural conditions, and high concern regarding neighborhood environments, indicating that undocumentedness can impact the living conditions in which immigrants and their families find themselves. In this article, the authors argue that networks of undocumented Latinas who have recently immigrated and who are without their familiar networks are vulnerable to domestic violence because they can become socially isolated and are not able to find help seeking safety. Undocumentedness results in a reduced set of rights for immigrants, and this articles explores the impact of reduced rights for victims of violence. Authors of this article develop a framework for how immigration-related policies affect health and conduct a review of studies that examine how policies, specifically, affect health. The findings primarily focus on health care access, a reflection of the state of the literature more than the actual factors that affect health. From their findings, they recommend research to focus on health outcomes. Using national data, this article investigated how naturalization among older immigrants related to their health outcomes. This may be one of the first studies to asses the effect of “receiving citizenship.” The authors make a strong argument for how naturalization affects political, social, and economic experiences and could potentially lead to differential health outcomes. The study found that older immigrants who naturalized earlier had better health than non-citizens. Curiously, a news article that reported on this study quoted Interim Dean of Portland State University who dismissed the importance of citizenship status. How do tougher immigration measures affect unauthorized immigrants? Another much-needed paper on how immigration policies are having a wide range of damaging effects on immigrants and their families. This article uses data from interviews with Mexican immigrants who had been deported Mexico. Although they do not find that anti-immigrant policies affect access to services, they find these measures are linked to deportation fear and interstate mobility. The authors of this article provide an argument for a deeper focus on on how undocumentedness can impact children’s development. These authors conducted an ethnographic study in New York of Chinese, Dominican, and Mexican families and have a clear understanding of the various life factors that are linked to undocumentedness that can impact the development of children. This article was part of series written by social scientists on immigration. The entire series can be accessed here. This article, in particular, describes the exponential growth of the detention and deportation systems, a key factor in the lives of undocumented immigrants and their families. Other articles in the series describe other policies and social processes that shape the lives of immigrants. 2014 will be a critical year for the immigrant rights movement as activists maintain the momentum from 2013 and continue to pressure Congress and the President. All of the efforts of 2013 – from activism to research – suggest that there is hope for achieving just immigration policies that can improve the well-being of millions of immigrants. The fate of immigration reform legislation this year remains uncertain (See below for more information). What is certain, however, is that immigration policy, in its current and future forms, will always have a tremendous impact on the rights, resources, and safety, and, ultimately, the health of immigrants in the United States. Public health professionals and immigrants rights activists will have to make critical assessments of how existing and proposed policies may protect or harm the health of our nation’s immigrants. Knowledge is needed for these efforts. However, there is very little information about how immigration policies affect public health. 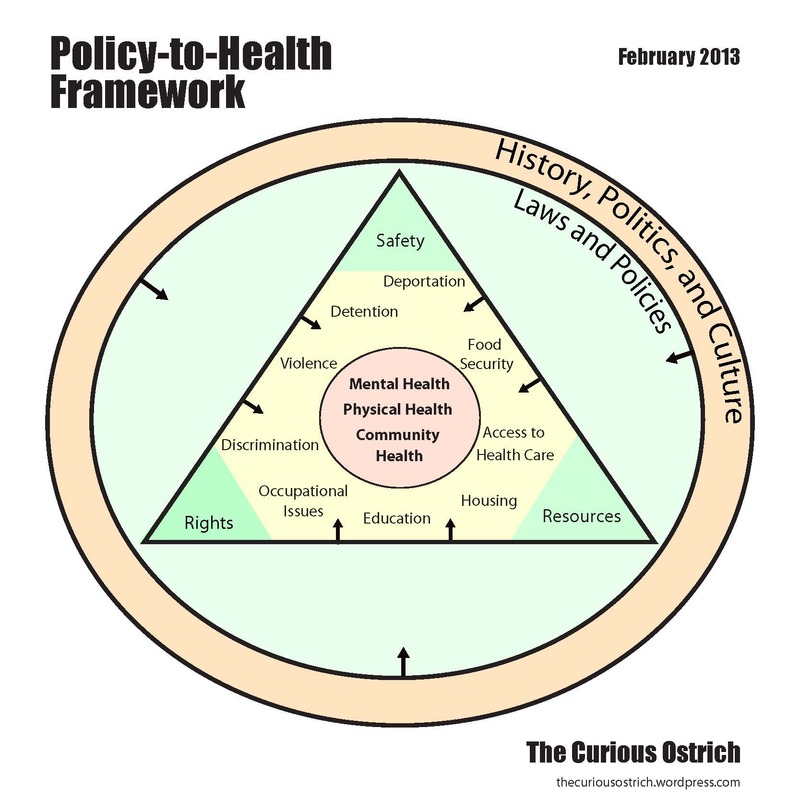 The Curious Ostrich’s Immigration-to-Health Policy Framework lays out the many ways in which policies may impact immigrant communities. We now offer our readers the Undocu-Bibliography, a collection of articles in the public health literature that consider the social environment faced by undocumented individuals – from access to health care to stigma and stress. The bibliography was compiled through searches on Pubmed, a free database of biomedical research run by the United States National Library of Medicine. We ran queries for articles on undocumented individuals that explicitly consider immigration legal status and how it affects well-being. This means that this bibliography focuses on studies that have conducted some form of analysis to assess the connections between immigration legal status and health. Studies of undocumented individuals that gave only brief mention to the factors that impact lives of undocumented peoples were not included. The Undocu-Bibliography reflects the current focus of public health research on undocumented individuals: the majority of articles focus on access to health care issues. While an important factor in health, it is but a small contributor to the collection of factors that can affect people’s health. Worth reading are articles highlighted in yellow that provide a deeper analysis of social and political factors that play a large role in the health of undocumented people. This living, working, evolving document will include a compilation of academic public health studies that consider undocumentedness. Our goal is to create a resource that is useful for researchers and advocates. In the long term, we hope to create a record of the important research in this area and support further work in this area. We encourage readers to send us suggested additions to this bibliography. If you are interested in learning more about where we found these articles and how we selected them, please check out our methods. If you need assistance viewing and using this bibliography, please contact us at ostrichblog@gmail.com. Action on immigration reform may happen yet! Immigrant activists all over the country rallied on Saturday, October 5th in 90 events at cities across the nation to demand legislation this year. The biggest event took place on the National Mall in Washington, D.C., the iconic site of so many important civil rights struggles. The National Park Service, technically on furlough because of the shut-down, opened up the Mall in the name of First Amendment rights to allow thousands of marchers to take the public space and demand “respect for our hard work and for the many contributions we make to the nation’s culture, economy, communities, and faith.” Similar marchers and rallies took place from Fresno, CA to the Twin Cities. While action is stalled at the National level, California has been leading the way in passing state-level pro-immigration legislation. The New York Times Editorial page has hailed this series of laws as a model for states to enact positive legislation in the context of federal inaction. Among the bills signed this month by Gov. Jerry Brown, was a bill for drivers licenses for all in California and the TRUST Act, which would prevent cooperation with ICE in some circumstances. Last week our nation celebrated the 50th anniversary of the March on Washington for Jobs and Freedom, presenting us with an opportunity to take stock of the future “jobs and freedom” of undocumented individuals. The greatest hope for a dramatically different system of immigration came when the Senate voted 68-32 in favor of the “Border Security, Economic Opportunity, and Immigration Modernization Act.” It was hoped that this solid majority was would pressure House Republicans to take up the bill, or to pass a similar comprehensive reform bill that then could be taken to conference with the Senate bill. The problem is that in recruiting Republican (and some conservative Dem) votes, the Senate bill is a dangerous way forward that will exacerbate the harmful and inequitable aspects of the current immigration system. While there are many positive elements in the bill, there were too many concessions that have ultimately poisoned the effort. Below we outline the major health implications, both the provisions that are positive (¡Bien hecho!) and the provisions that are harmful and should be deleted (¡Qué pena!). ¡Bien hecho! Finally, there may be a pathway to citizenship. This is major. Many undocumented immigrants living in US will have the opportunity to gain a full set of rights as citizens. Immigrants who are allowed on the path to citizenship will have increased job opportunities, be less likely to be exploited in the work environment, have increased educational and economic opportunities, and be able to vote. ¡Que pena! However, it’s too long of a pathway and it would not be an easy one. The Senate bill requires up to 15 years for undocumented immigrants to become citizens. That is 15 more years of diminished rights, including being barred from health care reform and other public benefits. Individuals who are unemployed for more than 60 days will lose legal status. Not to mention many individuals who will be ineligible to even begin this path. Ultimately, around 4 million people, out of 11.5 million, will not ever enter or finish this path. ¡Que pena! To entice the support of a handful of conservative votes, Democratic leaders added a boatload to the already bloated border spending. This $40 billion breaks down into 20,000 more agents (each armed with a lot of new and dangerous equipment); 700 miles of double-layered fencing, estimated to cost between $400,000 and $15 million per mile; at least $4.5 billion for surveillance technology in an effort to watch 100 percent of the southern border at all times, including drones at $18 million a pop and $3,000 and hour to fly; and millions more in contracts to IT companies to establish the national E-Verify system. This is at a time when the sequester has slashed health and education programs indiscriminately. Any concern about this price tag was conspicuously absent from those who, traditionally, are eager to bring attention to the “cost” of immigration. Plus, many corporations lobbied hard for extra security dollars that will ultimately please their shareholders. ¡Bien hecho! Allows an expedited pathway to citizenship and legal permanent residence for DREAMers, some agricultural workers, and some individuals will temporary status. ¡Que pena! However, these expedited pathways are based on a value judgement about the worth and deservingness of different classes of immigrants. Economic policies that have been instituted by the US (NAFTA is a biggee) are a major reason for the influx of immigrants. Instead of acknowledging its own role in immigration, the Senate instead paternalistically dispenses rights and benefits based on how “useful” or “sympathetic” different immigrant groups are. For more info on the Senate Bill, check out the Summary & Analysis from National Immigration Law Center. Any compromise with the House is going to introduce even more repressive measures to punish undocumented immigrants and their families. In fact, even Grover Norquist, one of the nation’s most conservative leaders (usually eager to cut taxes for the rich and cut social programs for the poor), has stated that legislation hasn’t passed because opponents (meaning mostly Tea Partyish Republicans and their ilk) are “anti-people.” Anti-people leaders, who are overwhelmingly white men with no concept of their privilege, have made it clear that they are not willing to share the benefits of this country with migrants. If a compromise must be made with these conservatives, it will water down many of the good provisions in the Senate bill, gained at a high cost of the punitive enforcement measures. On June 18, 2013, the Judiciary Committee approved this bill by a vote of 20-15. This enforcement-only bill would increase the reach of the deportation dragnet by further integrating local law enforcement with Federal immigration enforcement. This bill would essentially mandate more enforcement and tie the hands of Federal, state, and local authorities to practice discretion over detaining and deporting individuals. It would significantly expand enforcement policies and activities at the state and local level by allowing state and local governments to create their own immigration enforcement laws (remember Arizona’s SB 1070?) and expanding their immigration enforcement abilities – this is at the same time that it would restrict states and localities from noncompliance with involvement with ICE. It would also restrict the Federal government from implementing the DACA policy and increase its responsibility to take custody of undocumented individuals apprehended by local jurisdictions. It would also increase data collection and monitoring of undocumented individuals, including collection of information into the the National Crime Information Center database, while expanding criminal definitions of illegal entry and overstay of visas, gang membership and DUI driving. Finally, it would subject individuals who transport or “harbor” a person with the knowledge that the person is undocumented to severe criminal penalties under a so-called “alien smuggling” provision. This bill would establish metrics for “security” – essentially trying to measure and track the level of border enforcement – and include the US-Canada border in these efforts under the pretense of preventing terrorism. It would require that the metrics demonstrate that the Department of Homeland Security achieve 100% real-time surveillance of the borders and a 90% “effectiveness rate” (i.e. stopping unauthorized entries). This bill has been touted as a more moderate and reasonable approach. While it sounds a lot better than the SAFE Act, bill authors, Candice Miller (R-MI) and Mike McCaul (R-Texas) are using the influx of border enforcement funding to justify “accountability” for the success of these efforts. More funding, they argue, requires proof of “success.” This circular logic uses the increased funding to justify further militarization. 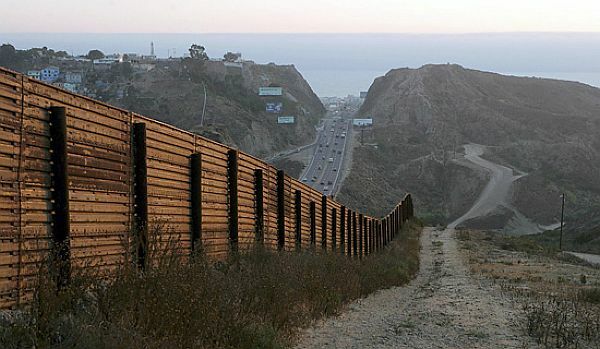 The bill passed the House Subcommittee on Border and Maritime Security and the House Committee on Homeland Security unanimously. Yes, that means it received bipartisan support. As you can see, these are all enforcement and no path to citizenship. When it comes to negotiations, sometimes the best move is no move at all. Even if the House were to pass a comprehensive reform bill, then it will be even worse, with more elements that blame immigrants and create toxic social environments. The Border Security, Economic Opportunity, and Immigration Modernization Act can only get worse. For these reasons, we should say no to reform as it currently stands. 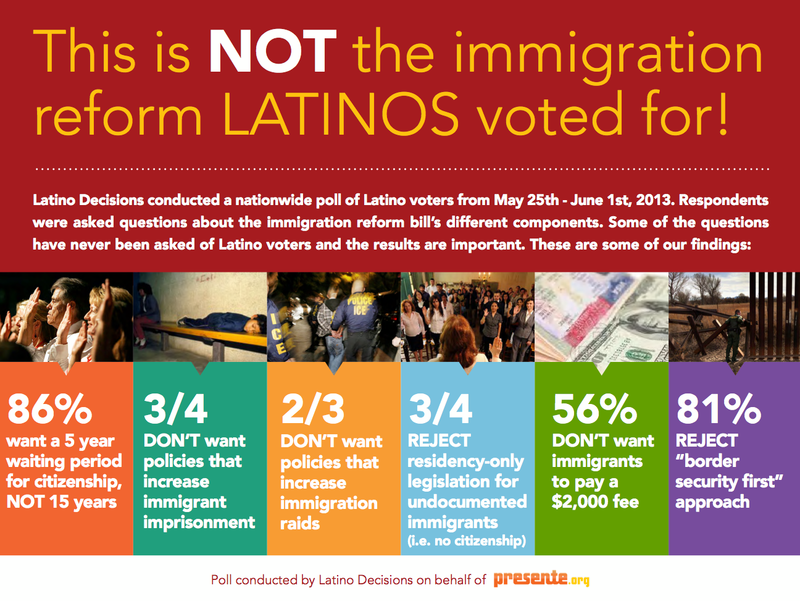 People of color strongly support a true path to citizenship, what we like to call healthy immigration reform. People of color are growing in number. There will be a price to pay for this hate-legislation, now is not the time to settle for a bad deal. not sure what’s up with me. When I think of it I cry. but it never fails to be a prison. The jaula de oro provides a haunting metaphor of the trapped position of undocumented workers in the United States – where the pressure and necessity of work exists within a society hostile to immigrants. For most immigrant workers, the jaula is more than abstract. Poor job security, immigration enforcement, low (and sometimes no) wages, and lack of basic protections create real barriers and physical limitations that, ultimately, wear and tear on their well-being. As we have seen with other issues, limited rights lead to limited safety and fewer resources for immigrants and immigrant communities. More in-depth research on the connections between employment, immigration, and health can be found in our Immigration and Occupational Health Bibliography. Click here for a pdf. As in the song, the fear of deportation is very real in the workplace. The term “immigration raid” generally conjures up images of ICE agents bursting through factory doors, handcuffing and deporting workers, and leaving ghost towns in their wake. These raids have been replaced with a new tactic – the Silent Raid. Immigration and Customs Enforcement (ICE) now pressures employers to fire their undocumented workers, threatening employers with large fines if they hire workers who do not pass the E-verify system. As a result, immigrant workers around the country – from the Chipotle food servers in Minneapolis, Minnesota to the Pacific Steel workers in Berkeley, California – have been denied their livelihood. The jaula de oro, jobless. Unsafe workplaces if workers are unable to speak out against hazardous conditions. Wage theft when unscrupulous supervisors, knowing workers have little recourse, cheat their pay. Limited labor organizing when union leaders and members are threatened with layoffs, deportation or detention. A study of Latino day laborers found that workers’ rights abuses, discrimination and social isolation have an additive impact on Latino day laborers well-being and substance use. In the absence of access to treatment or health care, many workers resorted to self-medication. Supportive family, religion, and friendships were identified as protective factors (Nalini 2011). A survey of workers from restaurants in San Francisco’s Chinatown found that 50% of workers experienced at least one minimum wage violation (Chinese Progressive Association, 2010). Consider the young woman interviewed by Human Rights Watch who was raped by her boss in a remote farm field in Central California. She was one of the few female almond pickers at her work. She did not feel safe reporting the assault to the authorities because of her legal status. Living and working on her own in the United States, she needed work to survive. Trapped by the fear of deportation and the male-dominated workplace, she felt that she must continue picking almonds. This woman’s story is played out among undocumented workers in countless situations throughout the US, resulting in mass scale worker vulnerability. Fewer protections can leads to dangerous and even abusive work conditions. Many times, entire workplaces or communities of immigrant workers are trapped in a cycle of low-wage labor. As the result of unenforced labor laws, unscrupulous employers, and the constant fear of deportation and retribution from their employers, many immigrants work for below minimum wage or no wage. In a striking example, immigrant workers in San Francisco’s Chinatown are shortchanged an estimated $8 million a year in wages by employers who violate minimum wage laws. Li Jun, an immigrant who works in San Francisco and shares a single resident occupancy hotel room with her family, says: “I want the government to enforce minimum wage laws. I want them to allow people like us to have just a little bigger space to live.” The occupational vulnerability that results from legal status forces immigrants into jobs with low pay and long hours – significantly reducing access to healthcare, healthy food, and healthy housing. What will immigration reform do to the jaula? Increase in visas for skilled immigrants. Utilizing a points system, individuals would be eligible based on educational degrees, employment experience, the needs of U.S. employers, U.S. citizen relatives, and age. Nonimmigrant W Visas for lower-skilled jobs. Workers would authorized to work for up to three years for registered employers in an occupation with labor shortages. W visa holders could eventually apply for merit-based green cards. Mandatory use of E-Verify. Also known as an Electronic Employment Eligibility Verification System (EEVS), a system for verification of workers’ authorization would be phased in based on employer size over a period of 5 years. “Blue card” status for agricultural workers. Workers who performed agricultural employment for no fewer than 575 hours between 2011 and 2012 would be eligible and then could apply for a green card in five years. Additional provisions include protections that ensure that employees could collect back pay regardless of their immigration status and increase legal protections for immigrant workers who are fired in violation of labor laws. The National Immigrant Law Center provides an excellent a summary and analysis of all of the provisions of the bill and the Washington Post has outlined the 48 amendments added during the Senate Judiciary hearings. and can never return to. Fortunately, despite many barriers and limitations, immigrant workers engage daily in forms of struggle to assert their rights. On an individual level, many immigrant workers, such as the woman who survived sexual abuse in her workplace in the almond fields, are connecting with resources and services that support them as they struggle to make a life in the United States. Others come together to create workplace or political advocacy groups. Around the country, immigrants, supported by advocacy groups, unions, and other workers, have been fighting in workplace-by-workplace winning back jobs and wages and increased labor protections. Some groups, such as the National Domestic Workers Alliance, have been able to advance public policies. Others, such as the Chipotle food servers and the Pacific Steel workers, have launched local workers’ rights movements. These efforts to gain greater worker protections and more progressive immigration laws, are essential to protecting the health of immigrant workers. Joaquin Luna came to the US as an infant. In high school he began applying to college with a dream of becoming an architect or civil engineer. In his application he is confronted with many questions: Are you a US citizen? No. A Resident? No. Social Security number? None. The pressure to support his family through an education and not being able to afford it are overwhelming. At 18 he takes his own life. José Antonio Elena Rodríguez walks along the US-Mexico border in Nogales, Mexico. At the same time local US Border Patrol agents are chasing two drug dealers. In the chaos, the agents fire several shots towards the border. Six bullets tear through his body, leaving him dead. Maria Isabel Vasquez Jimenez, a pregnant 17-year old pruned vineyards in Lodi, CA. One particularly hot day, the sun is too much. She loses consciousness into the arms of her fiancée who works with her. The job did not provide basic safety protections including drinking water, shade, or training on how to deal with heat. She dies of heat stroke. As public health professionals our goal is to keep people healthy and we often believe that everyone has the right to be healthy – that neither a person’s race, gender, nor socioeconomic status should be a predisposition to good health. There are many factors that prevent this ideal from being attained. Sometimes, laws and policies are the factors that prevent good health. US immigration policy is one example of a factor that creates an underclass of people with fewer rights, fewer resources, and less safety. Joaquin, Jose and Maria are victims of US immigration policy. > Can immigrants access appropriate and affordable health care services? > Are there protections for the rights of immigrant workers to ensure fair wages and safe workplaces? > Are immigrant children able to attend schools and universities? > Do immigrants feel respected and safe in their communities? All of these questions are decided by specific federal, state, and local policies that expand or limit the rights and resources that determine the opportunities for immigrants and their families, as well as their overall safety in this nation as they pursue those opportunities. When protective factors – such as access to health and educational services – align, immigrants will experience greater health and well-being. The lack of any or all three of these, such as limited access to employment and educational opportunities, stress and fear due to discrimination and anti-immigrant legislation, or vulnerability to violence, result in significant health risks. On April 17th, 2013, the Border Security, Economic Opportunity, and Immigration Modernization Act of 2013 was officially introduced in the United States Senate. This bill, if passed, would significantly change our current immigration policy context. It has the potential to offer a pathway, albeit a long one, to citizenship for the 11 million undocumented immigrants living in the US. However, it also introduces harsh enforcement measures, such as increased militarization of the US-Mexico border and mandatory implementation of an electronic employment verification system. The National Immigrant Law Center provides an excellent overview and analysis on their website. Immigration policy is health policy, and those interested in working to create healthy and strong communities should pay attention. Given the potential positive and negative impacts of the proposed immigration bill, this is the time for public health professionals to be active in the policy process, making critical assessments of how existing and proposed policies may protect or harm the health of our nation’s immigrants! Creating just policies that provide a pathway to citizenship will provide immigrants with rights, resources, and safety. It means that undocumented individuals and their family members will be able to live without being afraid that their immigration status will backfire and that they will be deported. It means that undocumented students no longer have to hide in the shadows, it means that farm workers will be able to bargain wages sitting as equals at the negotiation table, it means that youth and community members will be able to stand up against toxic hazards. Fortunately, the Bay Area is a hub of activity with many passionate individuals fighting for a more equal system. We encourage you to stand in solidarity with immigrants is to finally address the systemic exclusion. First, on Wednesday May 1st, there will be a large parade winding through Oakland. It will start at Fruitvale BART Station at 3:30pm.. The second event will be a 5k Run/Walk for Migrant Justice put on by 67 Sueños, a youth led organization out of Oakland. The event will take place May 4th at 11AM at Lake Merritt’s at the Pergola. For more details check out run.67suenos.org. If you think the system is unfair, unjust, and unhealthy, come out to support the movement for equity. Let your voice be heard! In honor of Women’s History Month, we will highlight the impact of state and national policies on immigrant women’s health. Immigrant women are often left out of conversations on a path to citizenship, deportation, and labor. When immigrant women are considered, it is often through negative stereotypes – from the portrayal of immigrant women a threat to national security because of “anchor babies” to raising the fear of immigrant women as taking advantage of social safety net programs. These harmful portrayals justify harmful laws, with real impacts on women’s health and safety. Policies and laws shape the safety, rights and resources of all people. Immigrant women are no exception: fear of deportation and family separation causes stress and anxiety; unauthorized status diminishes women’s rights and may lead to a range of forms of exploitation, from labor to sexual exploitation; or poor wages and lack of access to care can create barriers to health-promoting resources. The safety of immigrant women is threatened when immigration enforcement policies such as Secure Communities prevent women from accessing services or calling police. Other social policies also shape health. Health reform initiatives actively bar immigrant women from receiving safety net benefits. While the Affordable Care Act (ACA) opened many doors for women to receive reproductive health care, expanding coverage for preventive health care including family planning, STI screening, and screening for domestic violence, undocumented immigrants are excluded from the ACA. In addition, in the US we are currently experiencing broad attacks on women’s reproductive health; 43 new policies were passed in 2012 restricting access to abortion services (Guttmacher Institute). Low-income and undocumented women are disproportionately impacted by these laws as they rely more heavily on community clinics to receive reproductive health services. These policies, whether part of our immigration, social welfare, or health care systems, determine what services and supports immigrant women have a “right” to and shape access to health-promoting resources – from U-Visas for domestic abuse survivors to health insurance. One of the main narratives in research on immigrant health is the “Healthy Immigrant Paradox” (or the “Latino Paradox”) – in which immigrants have equal or better health outcomes despite lower wealth and education than US-born populations. This “paradox” hides many important issues and, despite some findings to support the theory, does not justify complacency about the health of immigrant women. Both gender and immigration status are important predictors of health. These multiple forms of discrimination overlap, or ”intersect,” to put immigrant women and particularly undocumented immigrants, at risk of a number of health challenges. Here is a brief overview of some of the many issues public health and immigrant rights activists might consider in their work. For more information, check out the research bibliography at the end of the post or feel free to contact The Curious Ostrich with any questions. •	Due to public health insurance program policies and limited access to employer-based health insurance, immigrant women are less likely to have health insurance, and less likely to have a regular source of health care, than non-immigrants (CDC 2005). •	When Massachusetts implemented their health care reform policy, immigrants were left out. And the increased fear of deportation created new barriers to care among women who had previously accessed services at community clinics (Dennis et al 2009). •	Immigrant women often work in informal jobs such as domestic work and in jobs with high risks for injury (e.g. garment work). Undocumented workers face discrimination in the workplace, lack adequate protections due to insufficient regulation of informal labor markets, work in high-risk industries, and have higher rates of occupational injuries. •	Immigrant women are additionally affected by gender inequities, such as wage disparities (Browne and Misra 2003), and gender and sexual discrimination in the workplace. •	Undocumented women have lower use of prenatal care services and higher rates of low birth weight, than documented immigrants (Korinek and Smith 2011). •	In border states with few abortion providers, such as Texas, Internal Border Patrol Checkpoints limit mobility, making it difficult for immigrant women to travel to abortion clinics. •	Intimate partner violence (IPV) is a risk factor for poor mental and physical health (Yick 2003, Barkho 2007). Although women of all national and ethnic backgrounds are victims of violence (Han 2010, Grzywacz 2009, Brabeck 2009, Bhuyan 2008, Barkho 2007), the immigration experience can exacerbate violence in relationships, putting immigrant women at particular risk (Han 2010, Grywacz 2009). •	Some women report that their partners use their vulnerable legal status as a way to control and threaten them – in a study of South Asian immigrant women in Boston, there was a strong association between having a partner who refused to help change their immigrant status and experiencing IPV (Raj et al 2005). •	A study of mother’s in New York City cited the fear of being “bad” mothers if they reported abusive family members (who would then face deportation) (Earner et al 2010). •	Immigrant women are at increased risk for poor mental health. 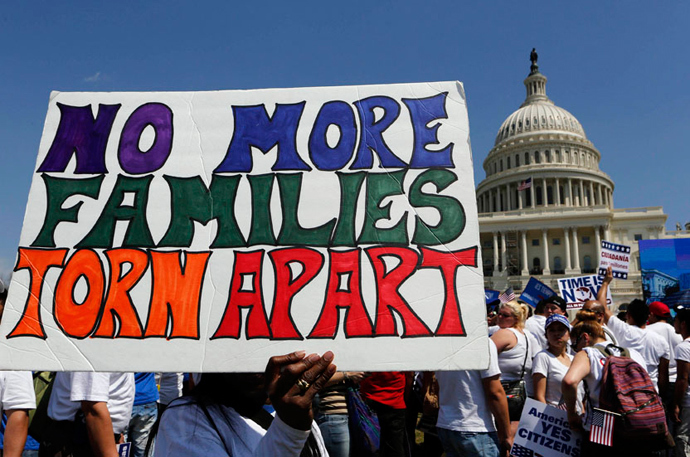 Fear of deportation and family separation, as well as the challenges such as language and cultural barriers, are significant stressors for immigrant women (Arbona 2010, Norris 2011). Yet, there are also policies and social movements that are promising to create better protections and facilitating increased social and economic opportunities for immigrant women. Protecting Women’s Rights: The Violence Against Women Act, renewed this year, continues to provide protections for immigrant women in abusive situations. The act includes the U-Visa, which allows women who have been abused who are here with temporary or unauthorized status to gain legal residence (Moynihan 2008, Conyers 2007). Supporting Integration: Policies that offer pathways to citizenship, or increase access to the rights that of citizenship, improve the health of immigrant women. In Western Europe, researchers found that in countries with more progressive immigration – or “integration” – policies including pathways to citizenship, anti-discrimination and affirmative action legislation, and policies protecting against economic and social exclusion, the health inequalities between immigrant and non-immigrant women were reduced and in some cases eliminated (Bollini et al 2009). In the US, state laws supporting immigrants rights also reduce health inequity. In 1999, Utah passed a law allowing undocumented immigrants to get driver licenses. While in general, undocumented women had poorer health outcomes than documented immigrants, those women who participated in the driver license program had higher rates of pre-natal care, demonstrating that policies supporting access to rights and resources among undocumented immigrants can significantly improve the health outcomes of women and children (Korinek and Smith 2011). Organizing: Immigrant women around the nation are actively involved in promoting policies and opportunities for themselves and their communities. There are many immigrant women’s groups working to empower immigrant women. Mujeres Unidas y Activas in Oakland, California provides immigrant women with support, from crisis intervention services to job training, as well as leads statewide advocacy campaigns. The National Domestic Workers Bill of Rights is a nationwide campaign to protect domestic workers, who are predominantly immigrants, in their workplaces. This movement is quickly spreading throughout the nation. There are also many immigrant women entrepreneurs – 13% of all woman-owned businesses – working to create job opportunities for themselves and others. There is a growing movement to protect the health of immigrants by expanding access to care and by pushing for a more humane immigration system. Women have distinct health needs (e.g. reproductive health services), and face distinct health challenges (e.g. the overlapping discrimination of gender and immigration status); and policies can unwittingly create new health risks for women when these specific issues aren’t taken into consideration. As these policy efforts move forward, we hope to see the rights of women explicitly considered and included in policy conversations.